Enjoy the breath-taking views surrounding Yellowstone National Park from an open cockpit! 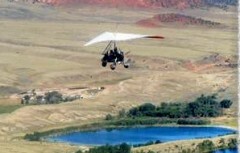 Enjoy the breath-taking views surrounding Yellowstone National Park from a powered hang glider. No experience necessary. Airborne over Cody offers introductory flights and flight instruction from a certified FAA flight instructor. Open daily from May to September. Reservations required.